How would you like to capture one of the most elusive butterflies vintage jewelry has to offer? Well, this signed WARNER brooch will give you that opportunity. 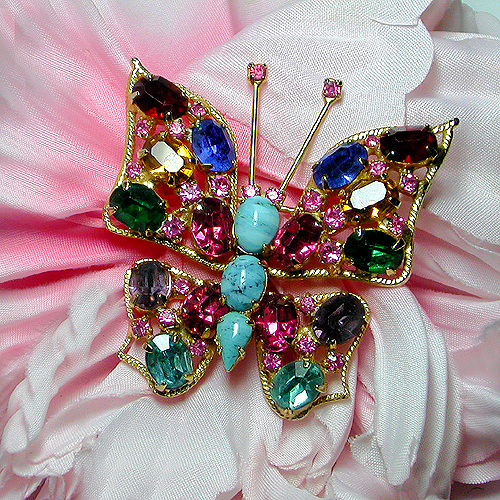 Joseph Warner used top quality crystals and rhinestones in creating his jewelry and this lush butterfly brooch exemplifies just such quality. The graceful wings have an open design set with gorgeous green, ruby red and marvelous marine blue crystals. But wait, there's more! Lovely lavender, beautiful blue topaz and precious pink crystals also adorn the wings. All stones are oval shaped and pronged. Sprinkled throughout the crystals are twinkling citrine stones. The body is composed of faux turquoise and the antennae are set with tiny citrine rhinestones. Set in a soft gold tone, it measures about 1 3/4" in length, 2" across the top and is in excellent condition. Now that you have all the relevant information you are ready to map out your strategy. How best to capture this charming creature? Perhaps a good net and the right angle will do the trick! I think though, most importantly, you have to be FIRST! !